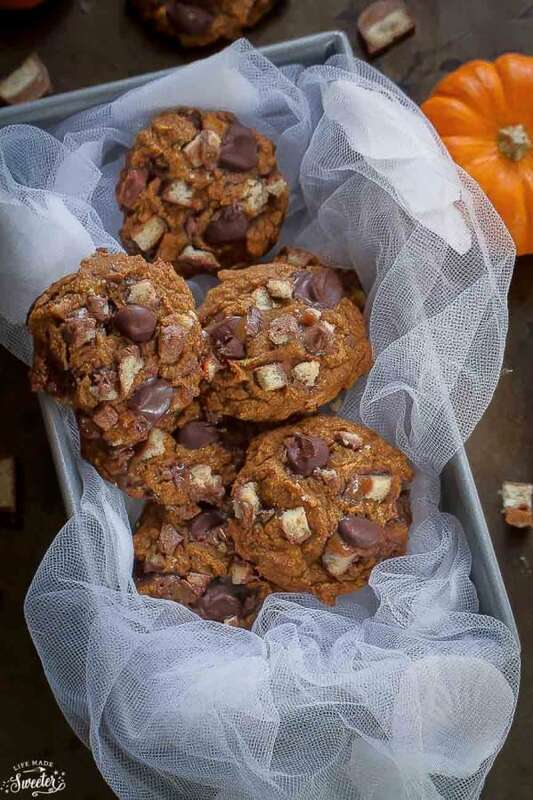 These pumpkin cookies are soft cake-like and loaded with Twix, dark chocolate chips and warm spices for a delicious fall treat. 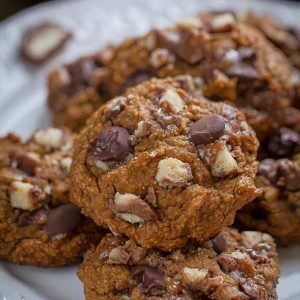 They are made with whole wheat flour and have NO butter or oil and perfect for using up any extra Halloween candy! Happy Halloween friends! Have any fun plans? We are taking the kiddos out trick-or-treating and couldn’t be more excited! Hoping the weather stays dry tonight since it rained two years in a row. My 19 month old can walk this year which will make it more fun and my four year old has been counting down the days to collect candy since last year. He had his school Halloween party this week and it was so adorable seeing all the costumes that all his class-mates were wearing. I took a gazillion pictures and brought along these Pumpkin Chocolate Twix Cookies that I made for the kids to snack on and to support a fantastic organization called Cookies for Kids’ Cancer. Cookies for Kids’ Cancer was founded by two OXO employees who were inspired by their son Liam’s battle with pediatric cancer, a disease which claims the lives of more children in the United States than any other disease. Cookies for Kids’ Cancer provides inspiration and support to allow anyone to easily get involved in fundraising to find a cure for pediatric cancer. Every year, OXO supports Cookies for Kids’ Cancer through their #OXOGoodCookies program where they encourage everyone to bake a difference with OXO for Cookies for Kids’ Cancer. I used OXO’s sheet pan, cookie scoop and cookie spatula in order to make these cookies and $0.25 cents for each of these specially marked products will go towards supporting pediatric cancer research. This year, OXO will donate up to $100,000 to support Cookies for Kids’ Cancer, through product proceeds, bake sale matches and other fundraising efforts. 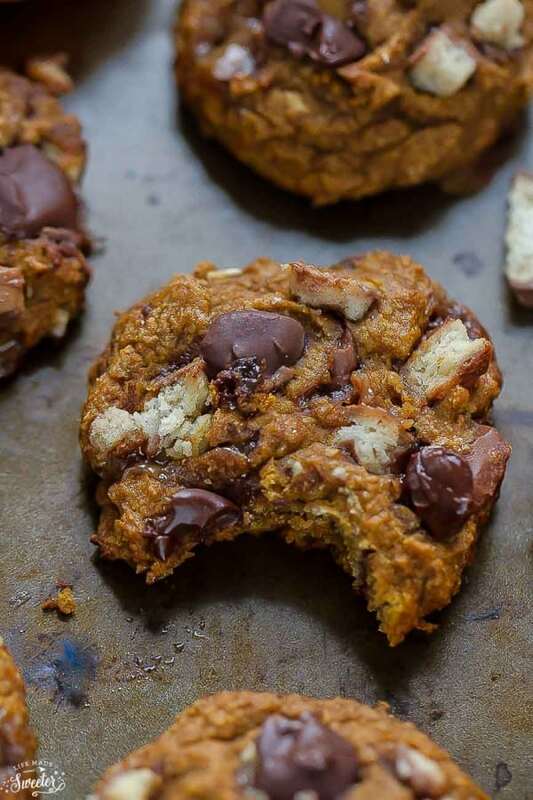 These pumpkin cookies are a small part of my way to try to help bring awareness to this amazing cause and they are also a great way for you to use up any leftover Halloween candy. Plus, for each blog post dedicated to this campaign, OXO will be donating $100 to Cookies for Kids’ Cancer , up to $100,000. In a medium bowl, whisk together flour, baking soda, pumpkin pie spice, cinnamon and salt. In another bowl, beat together the egg and brown sugar. Mix in the pumpkin and vanilla extract until combined. Slowly mix into the dry ingredients and stir until just combined. Do not overmix. Stir in the half of the chopped candy bars and half of the chocolate chips, reserving the other half for topping. Scoop out about 1 tablespoon sized portions of the dough onto a cookie sheet. Press remaining half of the candy bars & chocolate chips into the tops of the cookies. Bake for 8-10 minutes. Remove from oven and allow to cool on cookie sheet for 15 minutes. If you would like to help, please be sure to look out for specially marked OXO products with this green sticker. They will be available for purchase at participating retailers this month in support of this amazing cause. If you want to learn more about other ways to get involved, CLICK HERE. Disclaimer: This is not a sponsored post. I was selected to be part of OXO’s Blogger Outreach program, for which I received the tools & bakeware to make these cookies. All opinions are 100% mine. Kelly, I love these cookies and love this cause!!!! Hooray for cookies for kids’ cancer! I bet your kids are going to have so much fun tonight trick or treating! I can’t wait to see pictures! These cookies sound delicious! Great way to use leftover twix bars. That is, if I don’t eat them all first. Haha! Have fun Trick or Treating! We are off to do it tonight too and my oldest finally gets what’s going on so it should be fun! 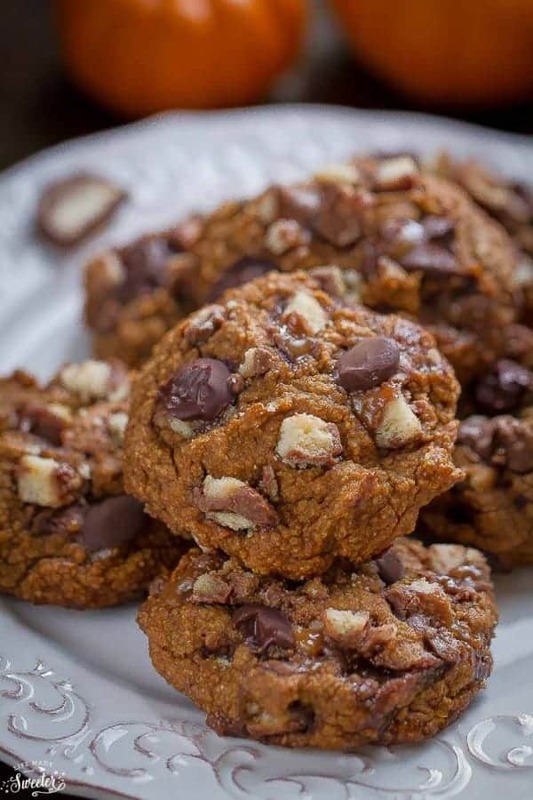 Hopefully we get some Twix bars so I can make these cookies! What a wonderful cause Kelly, love these cookies too, I bet your son was happy you brought these to school. Kelly, these look fabulous- pinning! What a great charity! 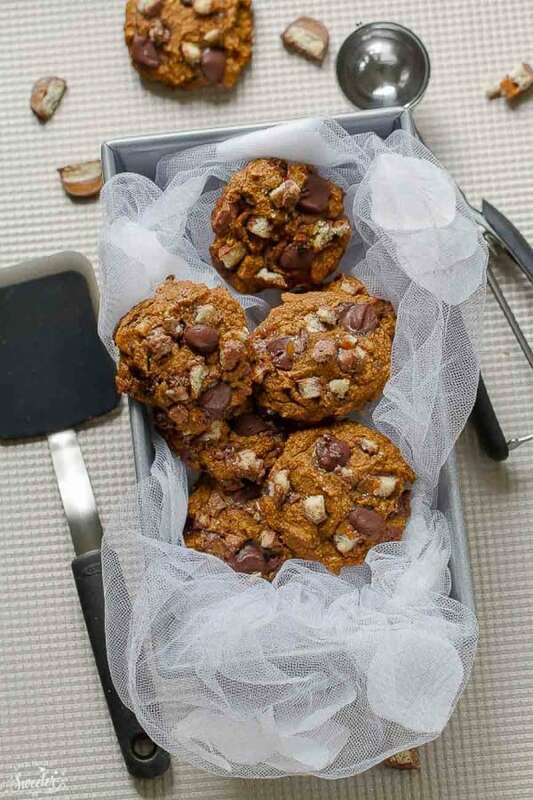 And these cookies look delicious — loaded with candy and chocolate, I’m in! Hope it didn’t rain on you guys and you had a Spook-tastic Halloween! These cookies are fabulous, Kelly! 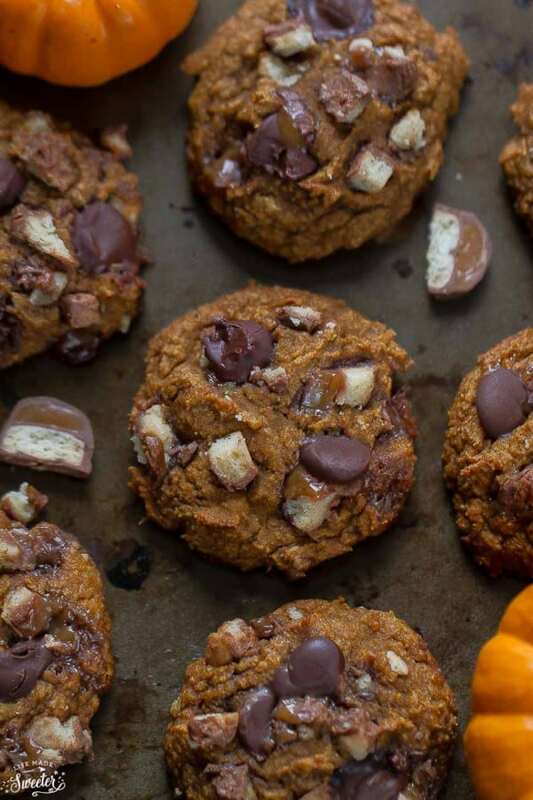 I’ve never had pumpkin with twix, but I bet the combination is amazing- especially in a cookie! Simply Perfect and a great way to use up some of that halloween candy! Pinned! Cheers, lovely! A wonderful cookie recipe for a great cause, Kelly. Candies in cookies! I would love such treat! Hope you had a great Halloween, Kelly. It was a crazy day yesterday, with a packed schedule, but we are kicking back today. : ) I have twix leftover and they are one of my favorites…everyone must have flipped for these cookies. The twix must work so well here – what a great idea! Hope you are having a relaxing Sunday! Hope you had a great Halloween Kelly! 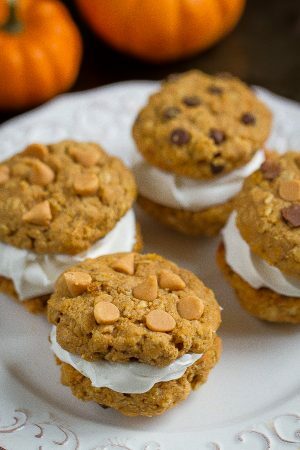 Love these cookies and now when I have some Twix candy left from yesterday I will definitely make them! Girrrrl, these cookies are phenomenal! You are so creative, and these sound delicious. What an amazing cause too! Thanks for sharing, Kelly! Wow these cookies are just calling my name, Kelly! I love the idea of adding twix in here! The caramel and chocolate sound like the perfect complement to the sweet pumpkin. Love it! Yum! What a great cause too! What a great charity and what great looking cookies Kelly. OK, I am way late, but had to comment on these killer cookies and for such a great cause. Your photos are mouth-watering.